VT-ARRIVA’s strategy is based on environment-friendly technology, a competitive pricing policy and a high quality service in order to maintain and increase its market share. VT-ARRIVA is committed to respect the environment: the average age of our vehicles is less than 2 years, all our buses are equipped with an EVV or a EURO 6 engine that provoke less air pollution. VT-ARRIVA’s accounts have been audited by an internationally recognized and certified auditor company since 1999. 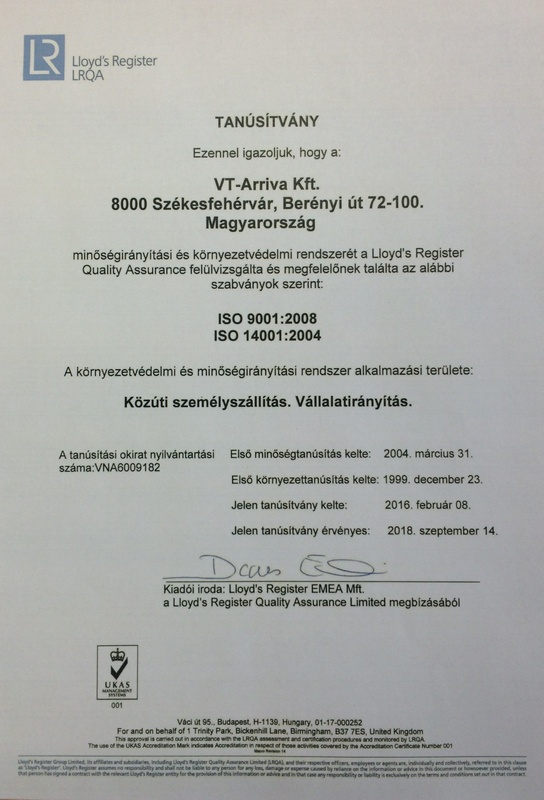 In accordance with its strategic criteria, VT-ARRIVA has an integrated management system that complies with EN ISO 9001:2009 and 14001:2005 requirements.